Woodrow: Hey guys! Mama called and she’s running late. But don’t worry, I’ll get dinner started. I know where she keeps everything. We thinkin’ tuna or chicken tonight? Sometimes I keep a stool in front of the cat food cabinet. I moved it away today and Woodrow took that as an invitation to help himself. He’s so cute as he walks backward all the way to open the door. Love his little belly! 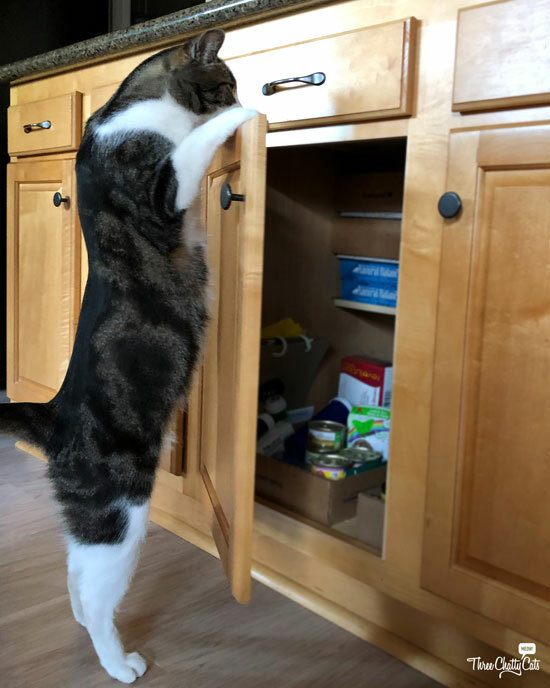 ❤ Do your cats get into the cabinets? Olive: Today is the day I will crush the red dot. Kitties everywhere, I will fight in your honor! I will slay the red dot and vanquish it forever! Kitties, are you with me? I said are you with me?!? Mama: Yes, yes, I’m sure they’re with you. Dinner is ready, so hurry up. Mama: Olive! Dinner. Come on. Olive: Mama! I’m monologuing here! Mama: Sophie, do you know who ate the dog’s food? 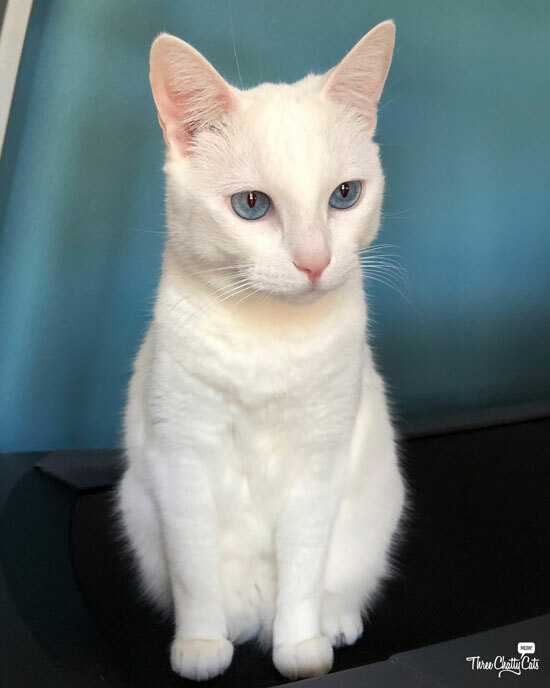 Sophie: Would this face lie to you, Mama? 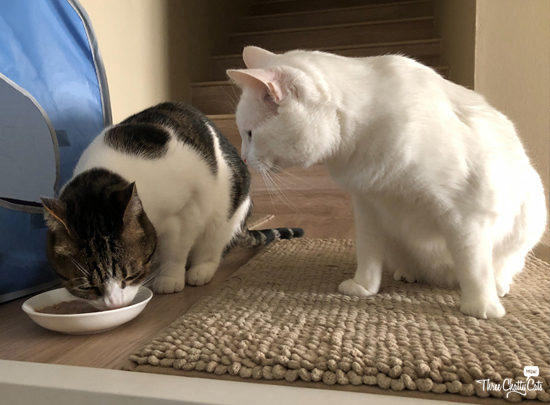 The routine is to feed the cats first (they get wet food) and then feed Eddie our dog (who gets kibble as part of his meal). The other day, I don’t know why but I set down Eddie’s food first. Sophie ran over to Eddie’s bowl before I could catch her. She heard me running and literally stuffed her face with his food, ran upstairs with me chasing after her and then she spit out her treasure – five pieces of dog kibble. 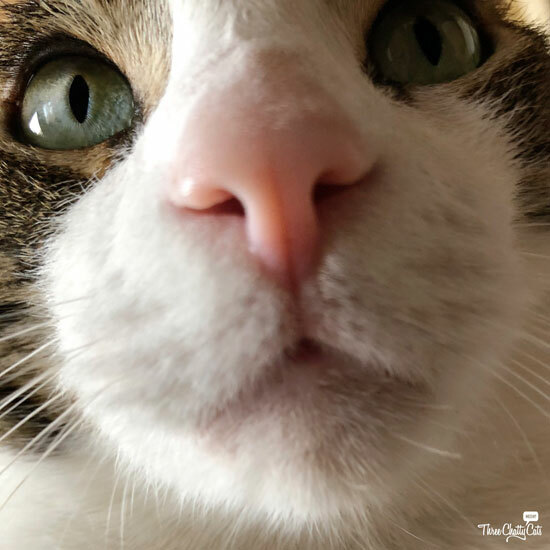 Think about how big dog food is compared to a cat’s mouth – I don’t know how she managed five pieces! 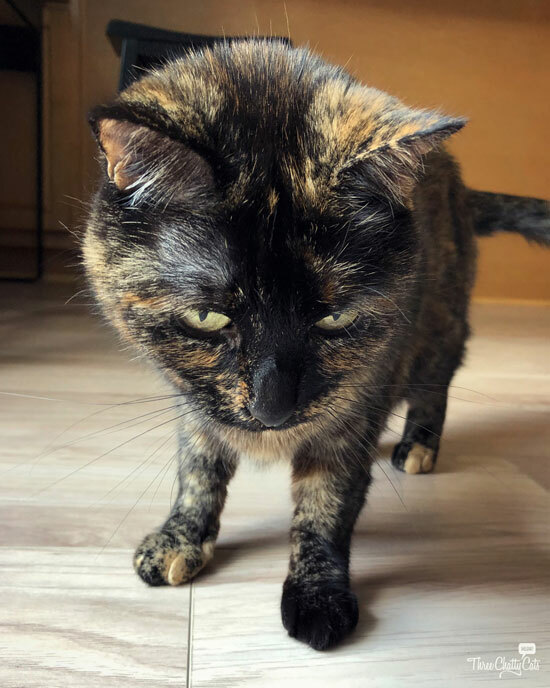 She is one determined cat…and a troublemaker. But adorable. Woodrow: Mama, is it time yet? Woodrow: Okay, do it. DO IT! Mama: Guess what, Sophie. Today is our one year anniversary of posting these daily chats! Sophie: How many of those chats and photos were with me? Sophie: Then I deserve 107 treats. Sophie: Let’s see…107 of 365 days is 29.315%. Let’s round up and call it even at 30 treats. Fair is fair, Mama. Mama: When did you become so good at math? Sophie: When treats are involved, I’m a math genius. I’ll take 15 treats now and 45 before bed. I started posting these chats one year ago today. My goal was simply to post a bit more on social media, but it turned into a daily occurrence. And then several months in, my goal was to make it to one year. Which is today! But don’t worry, we’re not going anywhere (the cats are still chatty after all). And thank you for following along! Without you all, there’d be no point. Anyway, I hope the cats brighten your day and make you smile. Dexter: Mama, grooming is very important. 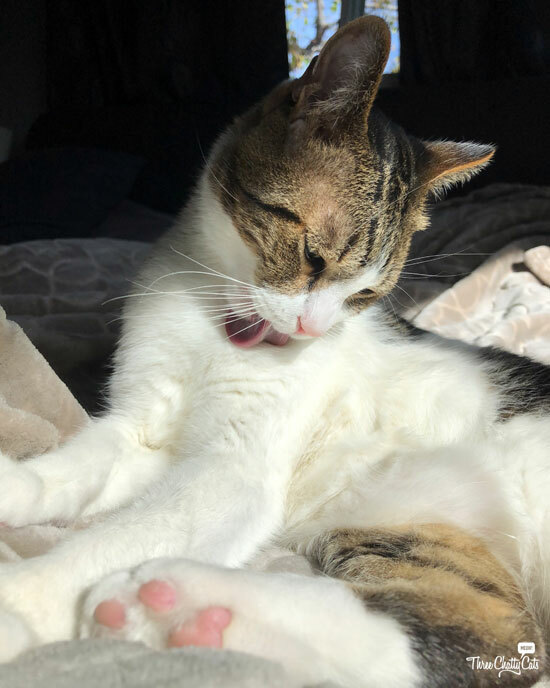 I groom like 5 to 6 hours every day. Dexter: Looks like you groom maybe 15 minutes a day? Harley: Come in, come in! Is anyone out there? This is Harley broadcasting to you from my super secret box location. Mama has betrayed us. 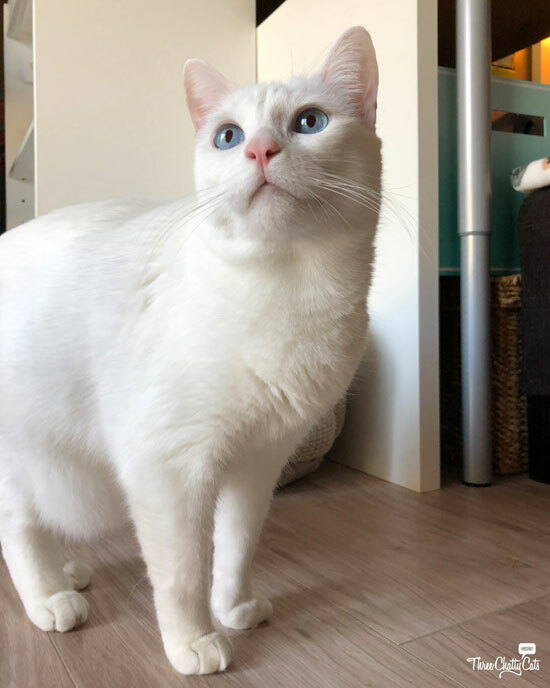 She has been visiting other cats…petting them, feeding them, scooping their litter. It’s horrible! Can anyone save us? Or at least me? I’m taking applications for a new mama. Mama: Harley, do you have my phone? Harley: I must go now. If you’d like to apply to be my new mama, you know where to find me. Over and out. End transmission. Buh-bye. 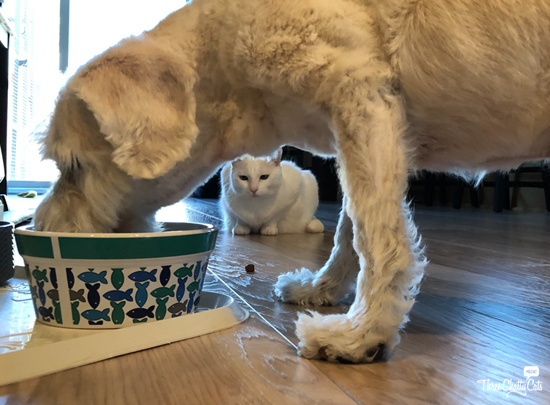 Further to the “Acquired Taste” chat above – here’s Sophie watching Eddie eat. See how he’s dropped a piece of food, taunting her? And don’t feel bad for Eddie…Sophie watches everyone eat. And remember, our giveaway for a Basepaws Catkit (two winners!) is open through Sunday, March 31st. Next Chatty Cats: Buddies, Zombies and More! We love, love, love your daily chats – what a wonderful way to start our days with a smile. I’m sure there are a lot of smiles passed around at your house just watching the crew lovin’ life there! Happy Chativersary and may there be MANY more! Haha brilliant pictures of Sophie overseeing everyone eat. happy blogoversary to youuuu!!!!! 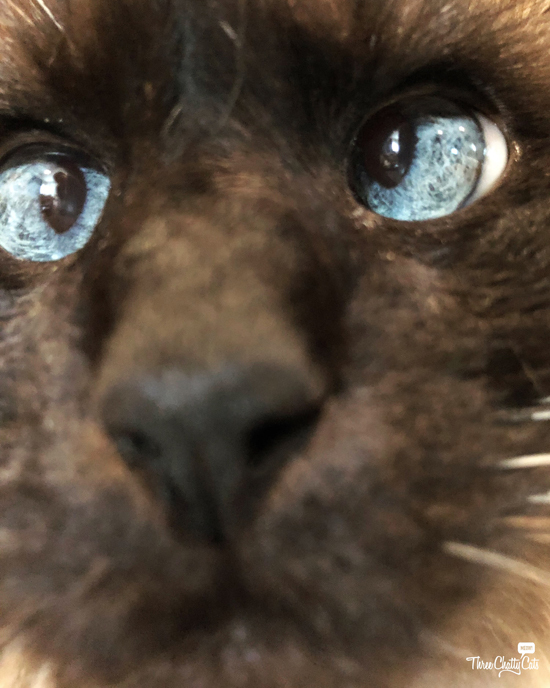 we love your cat chat!!! That Sophie is a stinker, but as you say, she can get away with it by turning on her cute! 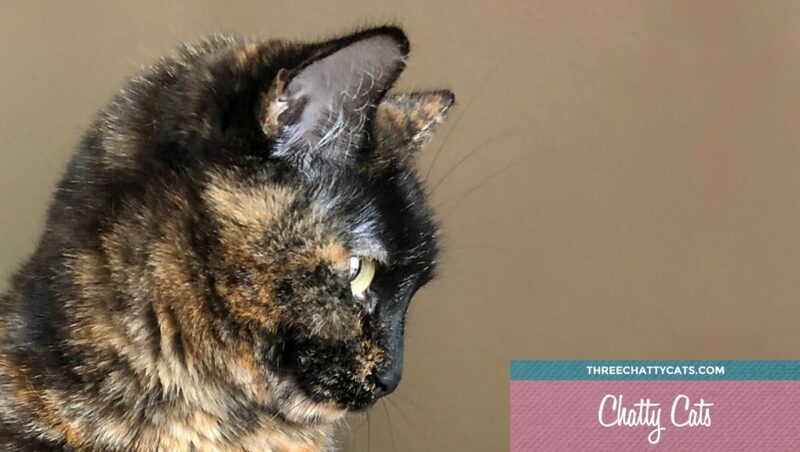 Happy Chatisversary! Sophie is like a stalker where food is concerned! We love the chats ! Concatulations on your Chativersary. Does Harley consider Mama traitorous when she pets the other cats in the household ? We’re confused..
Woodrow, you have the *cutest* figure!!! (Hope that doesn’t embarrass you!) Your daily chats are a highlight of our day! Happy Chativersary gang, your chats always top off our week with a smile! I LOVE these conversations! Sophie, you and Ellie would get along well. I love that Sophie dropped the food… I think my cats would have gulped while running!! My cats want doors open but haven’t figured out how to do it… most of the time I just hear them hitting shut, repeatedly, as a kitty pries a door open 1/4″ then lets go. But previous cats knew how to get into everything!! Currently, I just deal with PCB who likes to get on high perches (top shelf of linen cabinet or top of my closet) and move things around to get comfy, which results in other stuff being shoved off the edges… a sort of remote version of pushing things off counters! Congratulations on one year!! Wow, that’s awesome!! Your cat chats have made a whole lot of us smile! :D I enjoyed these so much! <3 All my love to you and your feline kiddos. Oops! My apologies. 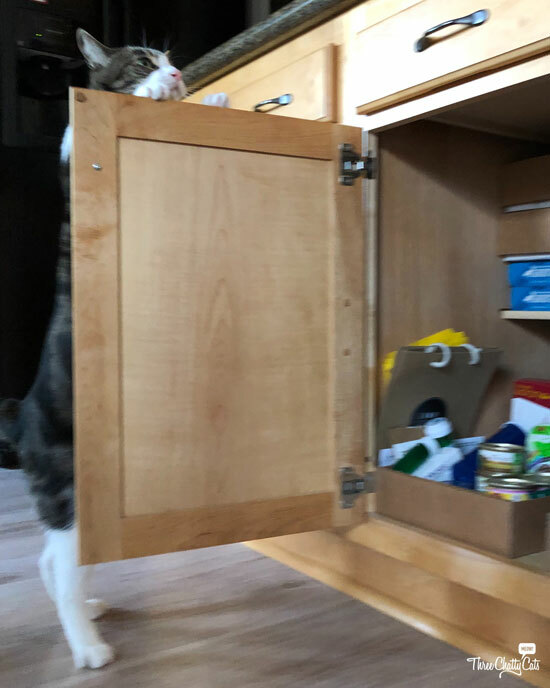 In my last comment, I meant to add (to answer your question), oh yes, our Dizzy does get into our kitchen cabinets! She has figured out all on her own how to leverage just enough claw to pop them open. Olive! Did you get that red dot? We’re gonna catch the one here, yes we are. Soon. I hope you had an amazing day celebrating your Chativersary! Mom and I hope you never run out of things to chat about. Harley, my mom’s been petting strange kitties, too, and feeding wayward ones on my porch. I hope our mommas aren’t thinking about replacing us! EEK! Tortie’s have the best “Who me? ?” looks! Happy Chativersary!! Once again I commend you – one year of daily posts… I know it is fun (for us for sure) but I know it is work too! One year – wonderful! Celebrate, you’ve done wonderful work, I always enjoy your posts.